Chinese mainland and Taiwan officials in charge of cross-Straits policy held a historic meeting on Tuesday and agreed to set up a mechanism for regular communication between the two sides. Zhang Zhijun, chief of the Taiwan Affairs Office (TAO) of the State Council, held the first formal meeting with his Taiwan counterpart Wang Yu-chi, head of Taiwan's Mainland Affairs Council (MAC), in Nanjing, capital of East China's Jiangsu Province. They addressed each other by their official titles. After nearly three-hour talks, the first official meeting between the two sides since 1949, Zhang and Wang reached a consensus to set up a mechanism for regular contact and communication between TAO and MAC, the Xinhua News Agency reported. 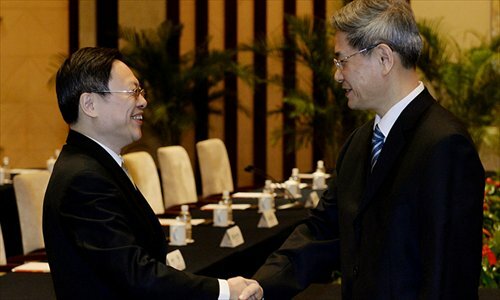 Zhang accepted Wang's invitation visit to Taiwan, saying he "is very willing to visit Taiwan in the foreseeable future." But the specific time was not decided, according to Wang. They also agreed to continue to push forward cross-Straits relations under the 1992 Consensus, which refers to the "one-China" principle and its respective verbal wording of both sides, and facilitate personnel exchange between the two agencies. The meeting itself represents a major breakthrough in cross-Straits relations and the new mechanism opens the door to political consultations between the sides, Li He, a research fellow with the Institute of Taiwan Studies at the Chinese Academy of Social Sciences (CASS), told the Global Times. Since Taiwan leader Ma Ying-jeou took office in 2008, cross-Straits contacts have been booming but all were at non-governmental levels. The Taipei-based Straits Exchange and Foundation (SEF) and the Beijing-based Association for Relations across the Taiwan Straits (ARATS) meet twice a year for dialogue. The setup of the new exchange channel between the authorities in charge of cross-Straits affairs will help strengthen mutual trust and symbolizes the further institutionalization of cross-Straits relations, which can "avoid misunderstanding and enhance the efficiency of communication," Wang said at a press conference after the talks. He noted that the new system can be complementary to the work of SEF and ARATS, China News Service reported. "The new mechanism can also help MAC and TAO solve the sensitive issues that SEF and ARATS are unable to deal with, since cross-Straits relations now stand at a sophisticated stage and many disputes exist," Li said. During the meeting, Zhang said that both the mainland and Taiwan should make up their minds not to let cross-Straits relations torment again or even go backward. "We must have some imagination" in solving the difficulties that hinder the development of bilateral relations, Zhang said. The officials agreed to continue discussing setting up liaison offices for SEF and ARATS and expand the exchange in various areas. The meeting, seen as an active move by Ma's Kuomintang party, would push the island's opposition Democratic Progressive Party (DPP) to adjust its policy toward the mainland and let its pragmatists be heard, Jin Yi, an expert on cross-Straits ties also with CASS, told the Global Times. He said that this will help reshape Taiwanese' understanding of the mainland. Su Tseng-chang, chairman of the DPP, said on Tuesday that his party supports the officials across the Straits having direct dialogue but opposes "secret and nontransparent talks of Ma's government," according to the Hong Kong-based China Review News. As for the highly anticipated meeting between Xi Jinping, general secretary of the Communist Party of China Central Committee, and Ma, Wang told the press conference the topic was not touched during the meeting. "It takes time for the mainland and Taiwan to gradually work out differences and it's not necessary to set targets too high for the current relationship," Li said.